100% cotton. 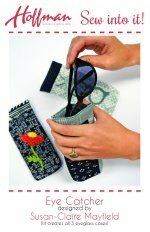 Pimp those specs with Hoffman’s newest and cutest Sew Into It! kit featuring Me + You’s Indah Batiks. SusanClaire Mayfield, aka The Gourmet Quilter, designed the fun and fashionable case dubbed the Eye-Catcher. Our kit includes all the precision-cut pieces you need to make three cases -- one for you, one for mom and one for your BFF. No templates, no paper, no Y-seams. Thread and love is all you need!